Above: Merritt Bucholz of Bucholz McEvoy. Image via UL. We're pleased to team up with Culturlann Doire to bring Bucholz McEvoy to both Belfast and Derry next Wednesday 31st August. 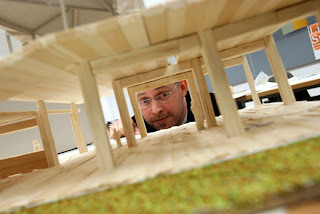 Merritt Bucholz and Kevin Walsh will discuss the firm's winning entry to the Electric Picnic Craftitecture competition. Their pavillion, produced with the Galway School of Boat Building, is under construction at the Electric Picnic site for use during this year's festival. They will deliver their talk at PLACE at 1pm and that evening they travel to the Culturlann to deliver the talk at 6pm.